July is in full swing, and by this, I mean the Tour de France. In the Ragfield world, July is synonymous with long hours spent in front of the TV watching our favorite cyclists ride approximately 3,500 kilometers around the entire country of France over 21 days in July. Just watching this race unfold is exhausting, but when its over, summer seems to lose its flair. Last Sunday, Rob and I rode Big Red (our tandem bike) out to Pontious Farm in White Heath. Its a pick your own blueberry farm, and as you might imagine, going there was my idea. For some reason I had thought it was only 15 miles away from our house, but it was actually closer to 20, thus making for a near 40-mile round trip. For Rob, this is nothing. For me, let’s just say I wished I would have eaten a bigger breakfast. Nonetheless, we made it there and back. I was in Blueberry Heaven at that farm. Seriously, if you live anywhere in proximity, go there. The family who runs the farm is so nice and very laid back. I don't think they are certified organic (its my understanding that it is quite pricey to get this certification) but they farm organically nonetheless. If they are out working in the fields when you are ready to pay for your purchase, they use the honor system—there’s a scale for you to weigh your sack of blueberries and a wooden box for you to put your money into. The blueberries are coming in a little late this year as a result of aberrant weather, but there were still plenty for us to pick. We must have gotten close to 2 pounds, and the whole thing only cost $2.63. I still can’t believe it. A measly little pint of blueberries can run you $6 at the grocery store or the farmer’s market and those aren’t even organic. I loved walking along row after endless row of blueberry bushes, searching for the purplish-blue ripe fruits among the leaves and little green berries. I felt like the monkeys, when I used to watch them painstakingly forage in the Capulin trees, searching out the tiny fruits that were just right. I would count how many fruits they got—sometimes in 1 full minute of foraging, they would find only 1 little berry. To me, all the berries looked the same, but they must have known what they were looking for, because they were sure picky about it. Of course, the howlers generally preferred unripe fruit, so for them, they were looking for green berries among green leaves—a task whose difficulty I only appreciated after our blueberry picking adventure. If all else fails and I never manage to finish my PhD, I think I’d like to start my own blueberry farm. I’d have to figure out some way to deal with the Japanese beetles though. At the moment, dealing with Japanese beetles seems a much more daunting task than writing my dissertation, so I’ll try to stick with that. Yesterday I had a surprise visit from Amy and the girls, who were en route from P-town to Indy. It was really great to see the 3 of them. Bryn and Shay were both so sweet. And Amy, I maintain that you are one of the coolest people I know! 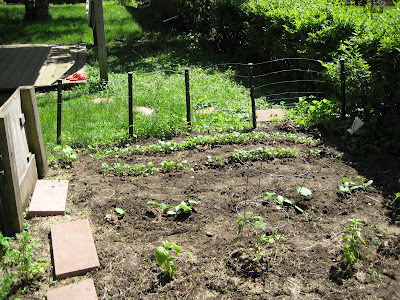 A few of you have requested garden updates. I took a couple pictures this morning and will post them with one from May 31st just for comparison. 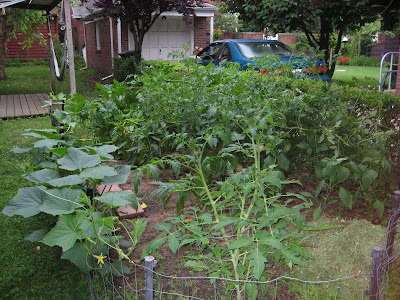 Back then, the garden was neat and orderly. Now it is a veritable jungle. On one of the cucumber vines alone, I counted 20 tiny little cucumbers. I didn’t count the cucumbers on the other 3 vines. 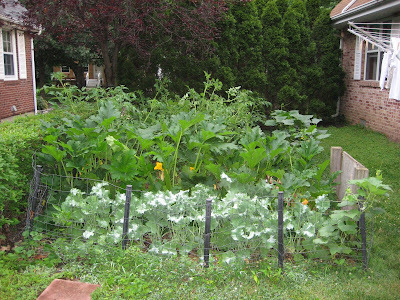 The zucchini pretty much overtook the garden. I actually pulled out 3 plants today. I watch them with trepidation, wondering if I can set up a roadside stand to try to get rid of all that they produce. The tomatoes have become gargantuan. I bought the largest tomato cages that the hardware store had—they have long since surpassed that and now the ever-growing branches are drooping back down to the ground. Does anyone who reads my blog know how to can tomatoes? I think I’m going to have to figure that out, but I really need someone who knows what they’re doing to show me. If anyone is interested, I would love to have you over; I can pay you in produce, that is for sure. Okay, back to work. Thanks for reading!